1-855-712-8551 serves as the phone number of a tech support scam better known as Error #268D3 (the error code it gives on most websites.) The scammers can try to call you using the number. You’re also likely to experience redirects and other difficulties while using your browser. The scam uses a page that looks uncannily similar to the Microsoft’s main site. The page claims that the featured number is toll-free and that it connects you with a Microsoft tech support specialist. To learn how you can get rid of the scam, read on. 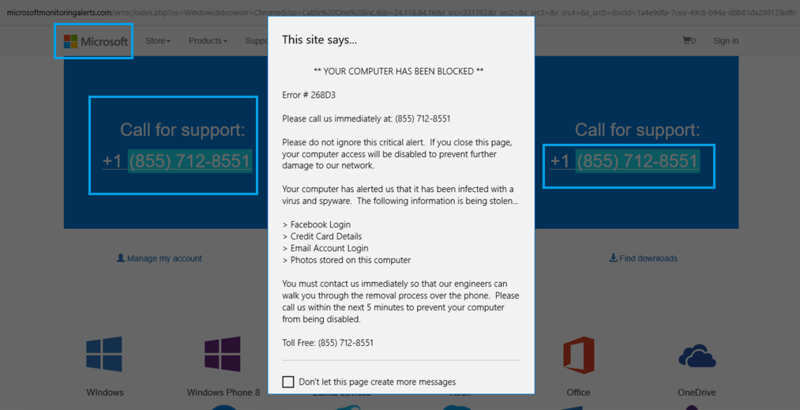 Tech support scams often lurk in ads and banners plastered over shady websites. They often enter the system when the user installs a freeware program that includes other bundled software. Checking the Custom or Advanced options while installing could prove invaluable for protection against all kinds of malicious programs. Unwanted programs capable of causing the Error #268D3 scam usually appear in your browser by masking as Microsoft Tech support sites. These doppelganger sites can be distinguished by their URL’s. If the site’s address is anything other than the official tech support page of the company they’re claiming to represent, chances are it’s a scam. Also, Microsoft doesn’t have a tech support phone line. If you see a phone number for Microsoft, chances are it’s fake. The #268D3 error can appear on sites, coupled with the 1-855-712-8551 phone number. That often happens to users who were infected with the tech support scam, many of which see the error messages on multiple sites they visit. The most common element of these web pages is that they all look like the Microsoft Support page. The scammers want you to believe that they’re Microsoft engineers that can help you fix your PC if you give them a call as quickly as possible. That’s incorrect, as the crooks have zero interest in helping you, and they’re not Microsoft employees, they simply can’t be. As we’ve said previously, Microsoft doesn’t have tech support phone lines. Don’t call any of the provided phone numbers under. They’re paid calls, and even a short conversation can cost a lot of money. In addition to that, the crooks will try to get personal information from you. Just by calling, you’ll give them your phone number, but they’ll try to get more personal information from you. That data would be sold on the black market. That can have very severe consequences for your safety. Another reason to avoid calling is that scammers make money out of these calls. That way you can unwittingly finance their nefarious operations, which will lead to even more people getting scammed. You can try to erase the Error #268D3(1-855-712-8551) scam from your system by following the step-by-step guide provided bellow. If, however, you find it difficult to remove it, the best course of action is to download a program specifically created to remove malware and other types of malicious files from your computer.